When building expressions in the Raster Calculator tool, clicking and double-clicking on the various layers, variables, buttons, and tool names available in the dialog box will help you to avoid syntax errors that may otherwise be made while typing. Since the expression entered in the Raster Calculator tool will be executed in Python, and Python is case sensitive, it is important to use the correct capitalization of the tool name. For example, to use the IsNull tool, be sure to type it as IsNull, instead of Isnull or isnull. When multiple Relational or Boolean operators are used in a sequence, the expression requires parentheses. For more information, refer to the usage tips listed in the Raster Calculator tool help. While Map Algebra is used both in the Raster Calculator and directly in Python, there are some differences in the syntax that you should be aware of. Since there is a specific output parameter in the Raster Calculator tool dialog box, Map Algebra expressions do not include an output name and an equals sign (=) when using the Raster Calculator. Only in the Raster Calculator tool dialog box can layer names be used directly with operators. When working in Python itself, layers must first be cast as Raster objects. Similarly, only in the tool dialog box can Raster Calculator variables be contained within percent signs (%) or quotation marks ("). Following are several examples of Map Algebra expressions that can be executed in the Raster Calculator tool. In these expressions, the raster layer names are contained within quotes, for example "dist". When using the Raster Calculator tool in ModelBuilder, the only difference is that variables can be used as input as well as layers. 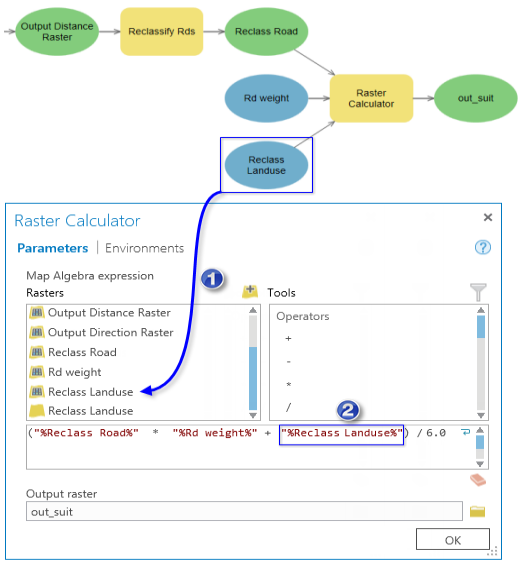 For more information regarding the syntax, what types of variables can be used, and the connectivity behavior of the Raster Calculator tool in ModelBuilder, see the Raster Calculator tool help. The example below shows the Map Algebra expression syntax of a Raster Calculator tool being used in a model. In this example, Raster Dataset Variable, a Long Variable, and a Raster Layer are being used. Raster Dataset Variable "%Reclass Road%"
Place the cursor at the appropriate location in the expression box. 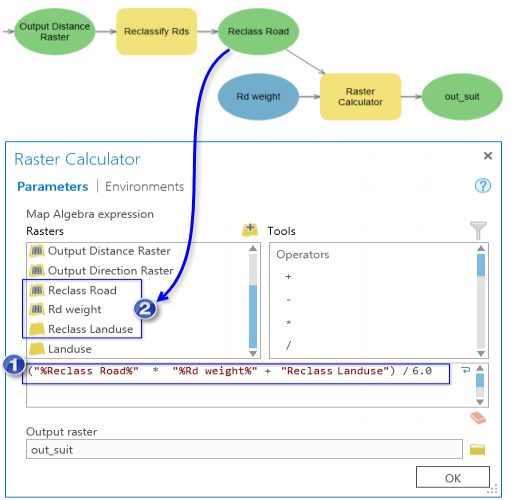 After clicking OK to close the Raster Calculator tool dialog box, a variable representing the "Reclass Landuse" layer will be added to your model as a model variable. The Reclass Landuse variable is added to the list. The syntax in the expression has been updated from the layer syntax ("Reclass Landuse") to the variable syntax ("%Reclass Landuse%").